Artweeks is Coming 23 Apr 2018 Beautiful creations by Eynsham’s awesome artists! Where to start? Eynsham artists are throwing themselves into Artweeks again from 5-13 May: Jane Tomlinson’s latest map will guide your steps. We also have a retrospective from earlier years. Nick Lewis is exhibiting every day at 7 Willows Edge. The paintings and prints will be sold to the highest bid, in aid of Refugees Welcome in Eynsham. Peter Shrimpton is displaying striking metal sculpture in the Swan Function Room; while Eric White’s mixed media and painting, at 28 Mill Street, focuses on the proposed site of Eynsham Garden Village. Julia Loken is showing botanical watercolours at her home in Tanners Lane. There will also be local landscapes reflecting on some of the places that may be threatened by housing development. Across the way, Alison Holmans makes quirky animals and garden features, wheel thrown and hand built bowls in stoneware clay - inspired by her New Zealand heritage and the chickens around her. 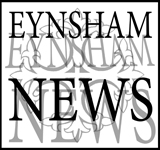 Meanwhile, Eynsham Arts Group members open a 10-day exhibition in the Bartholomew Room, with a wide range of affordable art, from framed original paintings to greetings cards.